In the past few years, many new days/ events have been imported (if I am not wrong) in Pakistan and it has become fashion to celebrate and talk about these events which neither belongs to our culture nor to our values and religion. Mother's Day, Father's Day, Valentine's Day etc are some of the example of these days. However Valentine's Day got more popularity due to some or other reasons. No doubt, role of electronic media for the promotion of this day is the most important. On 14th February every year, people of different countries and regions celebrate Valentine's Day. It was a Roman festival and part of western culture but unfortunately now many people are promoting it in our country too. If anybody asks me the question,"Will you celebrate Valentine's Day?" I will simply reply "No". I never celebrated and will never celebrate this day. But now the question is not from a single body but from the whole nation of Pakistan. So, we should try to analyze it on national level. First of all, Pakistan is Islamic Republic and Islam is the religion of more than 97% population of Pakistan and such deeds are strictly prohibited in Islam. Islam teaches us to respect women. 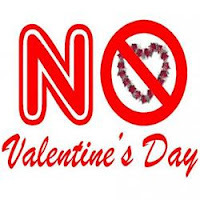 There is no place for Valentine's Day in Islam. In Islam, sensual form of love is only allowed between husband and wife. Secondly, it is misfit in our tradition, culture and values. Anybody, though he belongs to any religion or thought, will not even think about to allow girls of her family to celebrate this day. We should not blindly follow others without knowing significance of their festivals. This day makes no sense at all, in order to feel your lover feel special. People usually buy gifts to pleased his/her lover. They spend time with each other and give each other a feel that "you are special for me and I love you so much....." But the question is that should you not do all this on other days of the year. What about other 364 days of the year? Can you not say this any other day or time? Let suppose you feel love for your wife in January, should you wait for 14th February or express your feelings on that day. Love is a continuous feeling and it is very difficult to bound it to a day. Love is supposed to be special and surprise so if you do this on a specific day, its not a surprise. Some people tries to justify it by saying that it is the day of love. My answer to those is, why you restrict love to one day, we should spread love whole year. Conclusion: We should not celebrate Valentine's Day which is against the teachings of Islam. We should keep ourselves away from such events and tries to follow Quran and Sunnah in every matter of life. EXCELLENT articles , remember people we are MUSLIMS. To share love follow the quran and sunnah and not the way of the kufaar. I am not sure of this logic that says "why should we show our love one day a year, what about the other 364".... There are many things that are celebrated once a year. For example, Labor Day. Does it mean that laborers are celebrated only 1 day a year, and it is allowed to screw them the remaining 364 days??? That logic is flawed. Please do not use it in trying to justify things.